Discussion in 'Cars in General' started by GTPNewsWire, Aug 15, 2018. GRF, Robin and Mr Tree like this. it did also have a hatchback called the King Kong — which is excellent. I'm a bit curious, so I'll dare to ask - why? SecretAgentZero, girabyt3, baldgye and 3 others like this. Dammit. That's what I'd have chose. Also don't thing Geely will be calling this car the Geely Sir David Attenborough SUV. HarVee, jagenigma, SecretAgentZero and 11 others like this. Their lineup have names that incorporate terms like "grand", X, etc....so it should be something BIG, EXTREME..."the most everything", in one word! Now, becoming a little bit more serious, being connected to an important automaker like Volvo, doesn't make it automatically the same thing, but it might be a good start! 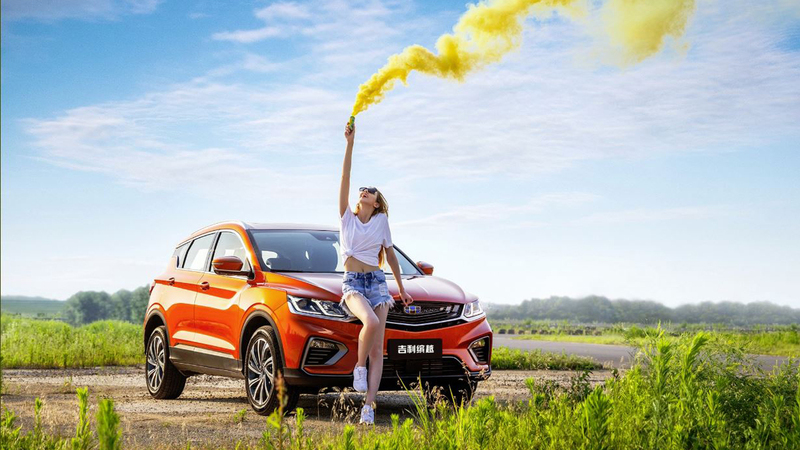 Looking at the picture, i see a (sub)compact crossover in bright color with a girl right next to it, so the name should say fun, young, versatile car! CLowndes888, FT-1, jagenigma and 7 others like this. Surely not long before that place will figure out about yet another internet poll happening. jagenigma and silverman_GT like this. Trucky McTruckface is clearly the only logical name. jagenigma, TheGeologist and SecretAgentZero like this. Hmmm, something simple like, uhhh, Geely Henan? They say the current name is "Bin Yue", so why not just simplify it to "Binyu"? *buys this car, looks at his old car* "Imma bin you!" in that case, you can't go wrong with naming it Geely Betelgeuse. Personally, if I were Geely, I'd ask Maserati nicely to make this new SUV be named Kubang. Because I love how it sounds. Sounds totally like something a Chinese car will do at some point. The "Yet Another Of Those Things"
I'd like to see it called the 'Geely Unicorn Arse Kicker' then. HarVee, AgentBlackDog and TexRex like this. FT-1, TheGeologist and AgentBlackDog like this. From the person that was rallying away in the White Privilege thread, this is spectacularly tone-deaf. Not least because Geely isn't a Japanese company. jagenigma, FoRiZon, AgentBlackDog and 2 others like this. What about; SUX ...oh damnit! This is hard! On a second thought, I think Geely Badum will do well too. Imitating a certain accent isn't racist. I'm from Alabama and people in New Jersey (all with NY accents) always make fun of my southern drawl. There's a difference between mimicking an accent and using a racial slur to degrade an entire culture. It's not like I called it the "Geely Ch*nk". We're all missing a trick here; we have the chance to literally name a car (an SUV, no less) the Canyonero. Snikle, HarVee, xturboloverx and 10 others like this. Divertimento - Italian for fun. Godere - Italian for enjoy. When I tried to write Godere my phone autocorrected it to God Erect. I think I need to get a new phone. Giovane - Italian for young. Young - English for young. Buono - Italian for good. Boneo - English dog treat. GoCat - English cat treat. Godzilla - Japanese for Skyline.